Hi, I’m interested in Nuts and bolts for sale. Please contact me. Thanks! 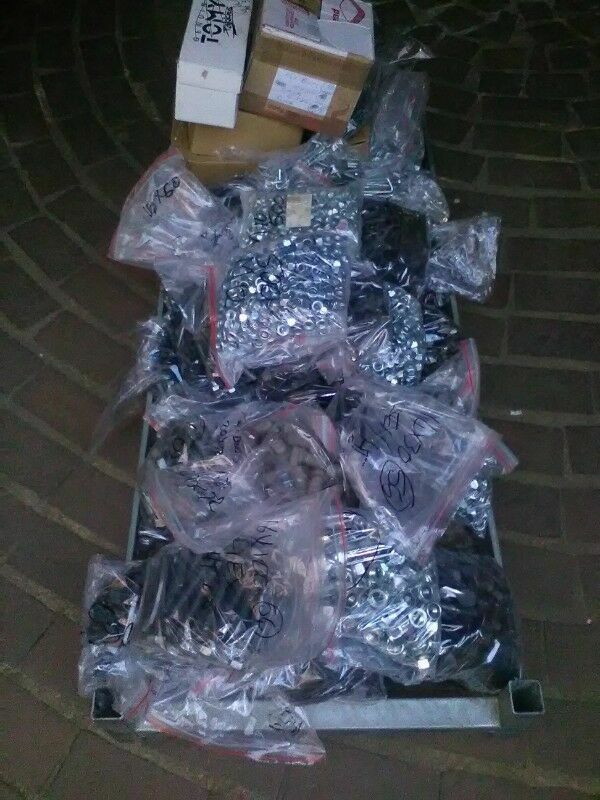 I have a whole collection of nuts and bolts for sale. It is stock that comes from a industrial supply hardware store that closed. The variety ranges from M5 to M20. For a detailed list send me an email (******) and I will reply with a list of types, sizes and quantity. Selling the whole lot as it is. Start your own business fulltime or partime and enjoy the benefit of being your own boss working in the comfort of your own house at your convient time. Get the Step by Step, Easy to follow formulation book. Easy and little start up capital required. Training and all necessary assistance req uired will be given when needed. There are 30 - 75 commercial/ household formulations included from R350.00 2 in 1 Window and Surface cleaner Automatic Dishwasher Powder Air Freshener(Water based) All Purpose Cleaner All Purpose Cleaner GEL Dishwashing Liquid Drain Cleaner Dry foam Carpet Cleaner Engine Degreaser Manufacture your own Fabric Softener Foam Bath Graffiti Remover(Wall stains) Household Bleach Thickened Bleach Heavy duty industrial Disinfectant High Foam Washing Powder Liquid Hand Soap Liquid Laundry Detergent Low Foam Washing Powder Multi Purpose Cleaner / Degreaser Oven Cleaner Pine Gel Pine Disinfectant Gel Sanitiser Scouring Powder Toilet Cleaner Tyre & Dash shine Waterless Hand Cleaner Window Cleaner and many more formulas. List of raw material suppliers and packaging suppliers is given too. Do not hesitate to Call, Text / WhatsApp 0813142551 for further enquiries. Stainless Steel interior and aluminium T bar flooring. All units with full PTI report. We sell all kinds of wooden pallets.we have in stock 4- ways entry and 2 ways entry standard industrial sizes are 1m x1.2m.. Used pallets for R45 each, New Pallets for R95 each. We also sell EURO / EPAL sizes are 1200 x 80 for R80 each , very good for furniture making,chairs,beds e.t.c. Payment method, cash on delivery....(C.O.D). and we are position to supply you good pallets , daily , weekly and monthly. try us and you we go home smiling. We are not scam please. Call George For more info or whatsapp 0629413358. Own your own online store.